AVAILABLE IN REGULAR BLACK AND LIMITED (150) WHITE VINYL! Includes insert w/lyrics and download card. LEGIONNAIRE’s music is based on powerful twin guitar harmonies, and medieval style epic melodies, while the lyrics often have influences from ancient or medieval mythology but also by other fictional themes such as Sci-Fi. 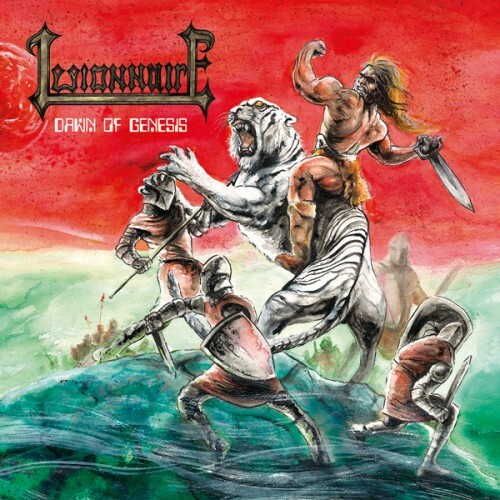 LEGIONNAIRE created an original, personal sound, though you can definitely hear tons of influences in their music: old Scandinavian metal, classic NWOBHM-style galloping riffs, an overall epic feel that brings back to mind US metal bands such as Liege Lord, Brocas Helm and obscure US epic metal release from the mid 80s. “Dawn of Genesis” was mastered by Wicked Ischianus of Mausoleum Gate. With bands like Legionnaire Heavy Metal will never die!